Affordable no longer means compromise. 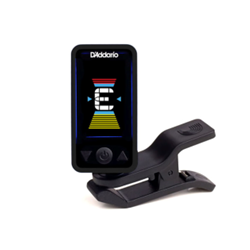 Introducing the D’Addario Eclipse Tuner--the modestly-priced tuner with unparalleled performance. The Eclipse chromatic clip-on tuner offers fast, accurate chromatic tuning on and off the stage. The tuner features a full color vertical display, auto power-off, and pitch calibration in a discreet, compact design. The multi-swivel action allows for the perfect viewing angle and can be mounted in front of or behind the headstock on right- and left-handed instruments. Available in a variety of colors. CR2032 battery included. -Tuner calibration from 430 to 450Hz.